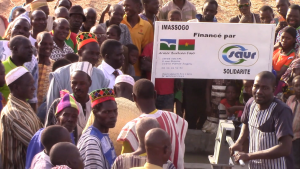 Saur Solidarités is supporting the work done by Armor Burkina Faso to help villagers in this West African country deprived of widespread access to clean drinking water. The endowment fund has recently financed the drilling and equiping of a well in the community of Guiba. Saur Solidarités is involved in working alongside the non-profit organisation Armor Burkina Faso to facilitate access to clean drinking water for rural communities in this country of the African Sahel. 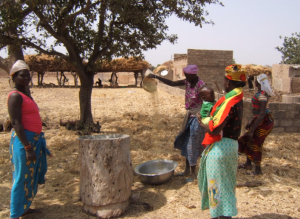 The project supported by the fund involves the creation of a well in Guiba, a community located in a very arid area approximately 100 kilometres south of the capital Ouagadougou. The aboveground installations were completed at the beginning of this year following the drilling of a well shaft to a depth of more than 60 metres to reach the water table. 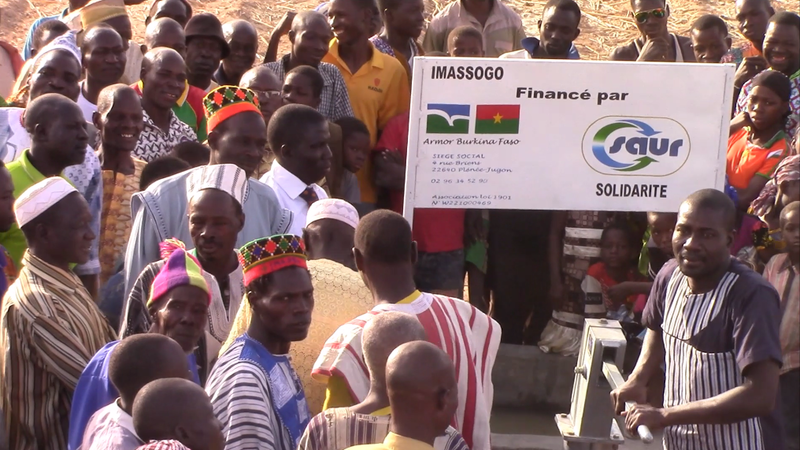 “But the work funded by Saur Solidarités doesn’t stop at equipping the well itself”, explains Louis Quintin, the Chairman of Armor Burkina Faso. “We are also planning the installation of two large-scale drinking troughs. These will not only recover water lost during the pumping operation, but also provide water for the livestock of local farmers”. The arrival of the water supply was accompanied by the creation of a community garden. The garden will be cultivated by pupils at the neighbouring secondary school to introduce them to good market gardening practices in accordance with the requirements set by the Burkina government for the education of its young people. The well was officially opened on Saturday 10 February this year, and the event was celebrated by all the community, who were amazed at the speed with which the project was able to be completed. “Previously, there was absolutely no clean drinking water available to this community of 45,000 people, and the women had to walk to a water distribution point 9 kilometres away to fill their water containers”, continues Louis Quintin. “It was when we were working on another assignment in a neighbouring village last November that representatives from Guiba approached us to explain their problem. We considered their request and submitted it to Saur Solidarités* on our return to France”. Things then started to happen very quickly. In just a few days, the proposal had been accepted and the funding granted immediately afterwards, which made it possible to begin work straight away by bringing in local contractors and drawing on the expertise of the organisation’s field volunteers to guide and assist with the project. The way in which Armor Burkina Faso runs its projects is a perfect fit with the type of initiative supported by the Saur Solidarités endowment fund. In practical terms, “The organisation isn’t content to simply drill a well and fit it with a reliable and robust manual pump”, explains Michel Bouliou form the Process Expertise team in the Saur West Brittany division, and the sponsor of Armor Burkina Faso. “It also empowers local people, making them responsible to ensure that the equipment remains operational over time. So 10% of the total investment must be contributed by the villagers themselves. A minimal contribution is then expected of each person who comes to draw water, and that money is used to maintain the installation in good condition and ensure that the well is valued by its users”. This approach and the fact that it is 100% compatible with the very principles of sustainable development were what quickly persuaded Michel Bouliou to work alongside the teams of Armor Burkina Faso and promote this Guida project to Saur Solidarités. Something that the women of Guida particularly appreciate. Armor Burkina Faso is a non-profit organisation based at Plénée-Jugon in the Côte-d’Armor region of France. Since 2007, it has been proactively involved in helping the rural communities of Burkina Faso, a landlocked West African country with a population of around 20 million people. The organisation runs projects that focus primarily on providing in-school, out-of-school, health and other types of education to girls. Armor Burkina Faso was persuaded to fund the creation of a well when it noticed the repeated absence of young women from literacy classes to walk several kilometres to fetch water. The coordination and implementation of its work are always supervised on site by a team of two, three or four of its volunteers. At the start of 2018, 13 wells were drilled to serve the communities of Manga, Gogo and Guiba.